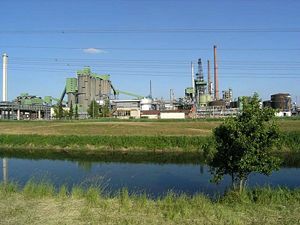 Hydrocarbons are obtained by refining petroleum at refineries such as this one. A hydrocarbon is any chemical compound that is constituted of just the elements carbon (C) and hydrogen (H). Each hydrocarbon molecule consists of a carbon backbone, or "carbon skeleton," with hydrogen atoms attached to that backbone. Hydrocarbons are among the Earth's most important natural resources. They are currently the main source of the world’s electric energy and heat energy (such as for heating buildings) because they produce large amounts of heat when burned. The gasoline that serves as fuel for automobiles consists primarily of hydrocarbons. In addition, many hydrocarbons serve as base materials for the synthesis of organic chemicals used in the production of consumer products and industrial materials. Hydrocarbons are the main constituents of petroleum (literally, "rock oil"), also called "oil," and natural gas. They are commonly found in and extracted from the Earth´s subsurface. Petroleum is a mixture of liquid hydrocarbons, while natural gas is mainly constituted of methane gas. The extraction of liquid hydrocarbon fuel from a number of sedimentary basins has been integral to modern energy development. Hydrocarbons are mined from tar sands and oil shale. These reserves require distillation and upgrading to produce synthetic crude and petroleum. A future source of methane may be methane hydrates found on ocean floors. A model of the alkane known as hexane. A model of the alkyne called ethyne. 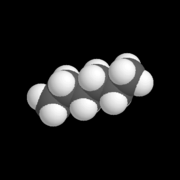 A model of an arene called benzene. alkenes: Each molecule of an alkene contains at least one double covalent bond between carbon atoms. alkynes: Each molecule of an alkyne contains at least one triple covalent bond between carbon atoms. Aromatic hydrocarbons, or arenes: Each molecule of an aromatic hydrocarbon contains at least one aromatic ring, in which the bonds between carbon atoms are aromatic bonds. When organic compounds are considered in general, saturated and unsaturated hydrocarbons are placed in the category known as aliphatic compounds, while aromatic hydrocarbons are categorized as aromatic compounds. The simplest hydrocarbon is methane, the main constituent of natural gas. Its chemical formula, CH4, indicates that each molecule of methane consists of four hydrogen atoms attached to one carbon atom. Ethane, with the formula C2H6, is a hydrocarbon (more specifically, an alkane) in which each molecule has two carbon atoms held together with a single covalent bond, and three hydrogen atoms are bound to each carbon atom. 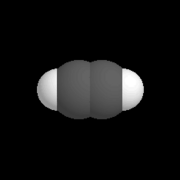 Each molecule of propane (C3H8) has three carbon atoms, and each molecule of butane (C4H10) has four carbons. 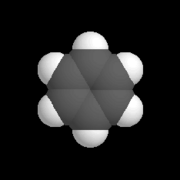 Cycloalkane: CnH2n (assuming a single ring, with all the carbon atoms in the ring structure). Alkene: CnH2n (assuming only one double bond in each molecule). Alkyne: CnH2n-2 (assuming only one triple bond in each molecule). Aromatic ring: CnHn (assuming a single ring, with all the carbon atoms in the ring structure). The above chemical formulas are based on the assumption that each carbon atom forms four covalent bonds, including bonds with hydrogen atoms and other carbon atoms. A double covalent bond counts as two bonds; a triple covalent bond counts as three bonds. A carbon atom in an aromatic ring is a special case and can have only one hydrogen atom attached to it. A "molecular graph" of a hydrocarbon is a simple representation of the carbon skeleton of the molecule under consideration. Each line in the molecular graph represents a covalent bond that connects two carbon atoms. Thus, although the graph shows no symbols for carbon atoms, a carbon atom is (by convention) located at each end of each line. The symbols for hydrogen atoms are not shown either, but each carbon atom holds as many hydrogen atoms as it needs to form four covalent bonds. Most hydrocarbons are combustible. When burned, they produce carbon dioxide, water, and large quantities of heat. This energy is used to heat homes and other buildings and to generate electricity. When heating a home, for example, oil or natural gas is burned and the energy released is used to heat water or air. The hot water or air is then circulated around the building. A similar principle is used to create electric energy in power plants. A hydrocarbon fuel (such as natural gas) is burned, the energy released is used to convert water into steam, and the steam is used to drive turbines that generate electricity. Hydrocarbons are also raw materials that serve as feedstock for the production of a wide range of organic chemicals, which in turn are used for such products as plastics, pigments, solvents, pharmaceuticals, and explosives. Hydrocarbon vapors can be harmful if inhaled. Moreover, hydrocarbons contribute to the formation of ozone in the troposphere. For these reasons, hydrocarbons in the atmosphere are considered to be pollutants. Ideally, the combustion of hydrocarbons should produce only carbon dioxide, water, and heat. Yet, incomplete combustion leads to the production of carbon monoxide, a toxic gas. Carbon monoxide binds to hemoglobin (in the blood) more readily than oxygen does; so, when carbon monoxide is inhaled, it blocks oxygen from being absorbed and leads to suffocation. Moreover, the hydrocarbon fuel being burned may contain other substances that are harmful when released. Moreover, carbon dioxide, a product of the combustion of hydrocarbons, is a greenhouse gas—a gas that helps trap heat in the Earth's atmosphere. This has led to concerns that the excessive burning of hydrocarbon fuels contributes to global warming. Morrison, Robert T., and Robert N. Boyd. 1992. Organic Chemistry, 6th ed. Englewood Cliffs, NJ: Prentice Hall. ISBN 0136436692. Solomons, T.W. Graham, and Craig B. Fryhle 2004. Organic Chemistry, 8th ed. Hoboken, NJ: John Wiley. ISBN 0471417998. This page was last modified on 22 January 2018, at 19:54.